No, this article is not a Shakespeare/Descartes mashup. Nor is it about whether your characters should actually think. Obviously, they have to think. This article is about how you decide which thoughts to show as inner monologue versus narrative. Inner Monologue: the direct, literal presentation of a character's thoughts, in their own words, as that character would think it in the moment. Narrative: everything else that isn't dialogue. Genevieve crushed the polite, yet thoroughly emotionless rejection letter, hurling it across the room. No! What am I going to do now? She dropped onto the couch, cradling her head in her hands. She could wait a year and try again. Was it worth it? Even if she made the team then, she'd still be a year older and a year slower than everybody else. She'd have to train in the meantime. Hard. It all boiled down to one question. Do I want it bad enough? The two italicized bits are the inner monologue, which present Genevieve's in-the-moment thoughts literally, just as she would think them. In this case the thoughts are in present tense, because she's thinking about her current situation, even though the surrounding narrative is in past tense; had she been thinking about the past or future, the thoughts would naturally be in past or future tense as well. Yet notice that except for the body language of dropping onto the couch, the un-italicized parts are also presentations of her thought process. They are narrative "glosses" over her thoughts: sentences which rephrase her thoughts in the narrative style, changing verb tense and pronouns as necessary, and at times expanding the wording for clarity. But how do you know when to use inner monologue and when to write a character's thoughts as a gloss? To understand how inner monologue affects the focus and balance of your story, it helps to understand what's going on for readers when they see some. Imagine your readers cruising along, absorbing the narration, processing the events that are happening, when all of a sudden, wham! They hit a spot of inner monologue. Both because of the italic formatting (if you're doing that, which I recommend) and because the material shifts from third-person narration to first-person thinking, the inner monologue really pops in their attention. It's like there's a little spotlight shining on those words. It's a very powerful effect. Anything put in the spotlight stands out precisely because everything around it isn't so brightly lit. Where does your eye immediately go in this painting? You can't help looking directly to St. Peter's face, right? Then probably to his hands, and only after that maybe down to the key on the ground. You focus there because that's where the light is. Nothing stops you from directing your attention to the stonework behind him and to other details hidden in the shadows, but I find that this takes particular effort. My eye keeps jumping back to the light. Rembrandt called it chiaroscuro—literally, "clear and obscure". We're working with words, not light, but it's still the contrast in voice and formatting that makes inner monologue so powerful. Rembrandt's painting wouldn't have half the power it does if the entire room were well-lit. Your eye wouldn't know where to go. Similarly, if you shine the spotlight on every single thought your character has, you kill the contrast and the inner monologue loses its power. Inner monologue is a spotlight. But as the above example shows, characters have lots of thoughts you could put in inner monologue; how do you decide where to aim the spotlight? You aim for the heart, by illuminating the bits with the strongest emotional content. Typically, those are moments when a character is reacting emotionally to whatever's going on. 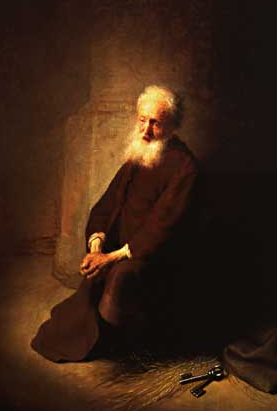 Rembrandt put the light on St. Peter's face because that's where the emotion is. You use inner monologue for a character's immediate, reactive thoughts for exactly the same reason. Visually, our emotions telegraph through our faces. That's what Rembrandt had to work with. Readers can't see your characters visually, but that's ok because emotions also telegraph through our thoughts. That's what you have to work with. When Genevieve thinks what am I going to do now, in conjunction crushing and throwing the rejection letter, we immediately infer how she feels. You don't have to tell us "she felt devastated" or whatever. And because we figure it out for ourselves, those feelings seem genuine to us. We instantly read Genevieve's frustration, anger, and heartbreak through her inner monologue. Towards the end of the paragraph, the next little flash of the spotlight reveals her sense of resolve. Contrast the spotlight of inner monologue with the rest of the glosses in the example. In those, Genevieve isn't in the throes of an emotional reaction. She's processing facts, as the beginnings of evaluating her options. That's a far less emotional kind of thinking, and doesn't deserve full inner monologue treatment. If you try to shine the spotlight there, you kill the contrast and make readers wonder "why are you putting so much emphasis on this?" Reserve inner monologue for those moments of sharpest emotion. Remember that, and your characters' emotions will shine clearly in the spotlight of their thoughts.